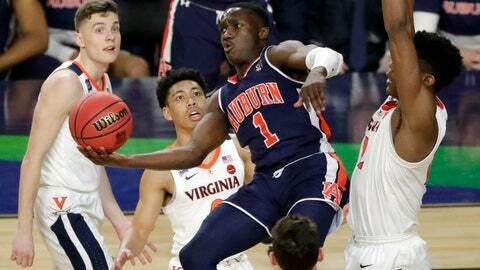 AUBURN, Ala. (AP) — Auburn point guard Jared Harper says he will leave school at the end of the spring semester to enter the NBA Draft. Harper helped lead the Tigers to their first Final Four appearance before a 63-62 loss to eventual national champion Virginia Saturday. He said Tuesday he plans to sign with an agent. The 5-foot-11 junior ranks fifth in Auburn history in career assists, including a school-record 231 last season while averaging 15.3 points a game. Pearl calls Harper “a special player with speed, quickness, power and a skill level that is unmatched by virtually any player his size” and predicts he will succeed in the NBA. Harper was the Midwest Regional Most Valuable Player.